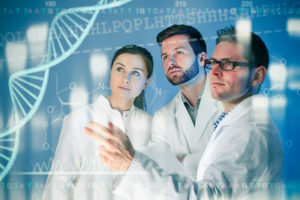 Scientists from the United Kingdom recently published a study outlining a potentially significant breakthrough in the fight against aggressive colon, lung, and breast cancers by identifying the genetic markers regulating cancer growth. In their report, the researchers demonstrated tumor growth may be decreased as much as 75% when scientists targeting one-specific gene and noted that 18 others either aid in tumor growth or can slow down the metastasization. Furthermore, researchers identified other genes responsible for regulating the body’s immune system, which could help with a patient’s natural response to fighting mesothelioma and other cancers. By stunting tumor growth and energizing the immune system, immunotherapy researchers believe the human body itself may be the key to effectively fighting cancer and getting patients into remission. Do Companies Still Use Asbestos? Asbestos is a white, flaky mineral used for its heat resistant properties in various industries including construction, pipe fitting, shipbuilding, and as an insulation. While its physical properties and low cost make it ideal for use in many industrial applications, the mineral is extremely toxic and has a causal link to developing mesothelioma. Asbestos companies and manufacturers using the material knew about the dangers associates with it but continued using it for years. As a result, hundreds of thousands of victims developed mesothelioma, an extremely rare and deadly form of cancer commonly affecting tissue linings around the lungs and abdomen. Despite all this, asbestos can still be used in certain products today, like vinyl flooring and cement shingles, though it is heavily regulated. That may soon change as the Environmental Protection Agency (EPA) recently announced adding asbestos to a list of 10 toxic chemicals the agency looks to ban in 2017. After a mesothelioma diagnosis, mesothelioma patients and their family members often have many questions about the contractions and treatment of the cancer. One of the most common questions is whether or not mesothelioma is a preventable disease or if there was something in the family history that caused it to develop. One of the most important things mesothelioma patients and their families should know is that the disease is extremely rare and most commonly associated with exposure to asbestos, a flaky white mineral commonly used in insulation and other industrial applications. Companies have known for decades about the causal link between asbestos exposure and risk of developing the deadly cancer. Despite knowing asbestos posed serious health risks to workers, many companies chose to continue using the material due to its heat resistant properties and low cost, just another example of business putting profits before people. Had companies acted in good faith on the knowledge they had for years about the dangers of asbestos, potentially thousands of lives could have been extended. The former Environmental Health and Safety Officer for Paterson, New Jersey schools recently hit her employer with a lawsuitclaiming the defendant fired her as a retaliatory act for exposing the district’s illegal removal of asbestos from a school classroom. Since 2008, the plaintiff’s role with the school district had been to ensure the health and safety of around 23,000 students and 5,400 staff members, but she was apparently not allowed to perform her job for the sake of cutting costs. According to her lawsuit, the plaintiff alleges she faced a hostile work environment after taking issue with the school district’s removal, storage, and disposal of asbestos and mold from several sites. Most notably, the school district allegedly hired contractors without the proper licenses to remove and dispose of the dangerous asbestos.